Slurry Corrections for Centrifugal Pump Performance - Engineered Software, Inc.
By Aasya Abdennour | Engineered Software, Inc. Correctly sizing and selecting a pump is crucial in any situation, especially when efficiency and cost considerations are in play. Improperly sized pumps can lead to additional wear and tear, performance and cavitation issues, and an overall decrease in the life expectancy of a pump. One must also factor in the cost of replacement and the possibility of downtime for the system to repair a pump that is incorrectly sized. With any pump selection, the pump materials and process fluid compatibilities need to be considered—specifically, whether the pump’s inner components (impeller, casing, shaft and seals) can endure abrasive or corrosive fluids. If pumps are used in slurry applications, these issues will be magnified because of the physical characteristics and hydraulic properties of slurries. Slurries carry solid particulates, which increase the internal friction of the fluid. This can accelerate the wear on a pump’s impeller and inner casing and cause other issues. Since pump performance curves are typically generated using water as the testing medium, to properly size and select a slurry pump, the water-based performance needs to be de-rated. Slurry pumps are present across many industries, from chemical to the mining sectors, shown in a typical application in Image 1. Of all installed centrifugal pumps in the process industry, 5 percent are slurry pumps. Several methods can be used to correct pump performance for slurries. This article covers the Hydraulic Institute (HI) method and the Wilson method (a modified Sellgren Method). The carrier fluid is water at standard conditions. The solid particles are insoluble in the carrier fluid. The solid particles are spherical and uniform. Slurry correction methods will primarily require density and concentration data. For HI and Wilson, the methods also heavily use the particle size value to determine both the category of slurry and the correction factor (Hr) itself. This particle size, or d50 value, is the median size of a slurry. In other words, it says that 50 percent of the particles within the slurry are of that size value or smaller. This can be determined using a sieve analysis of samples in the slurry. 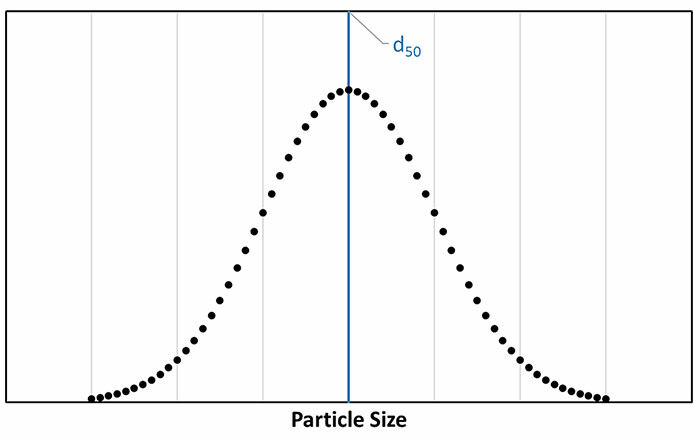 The particle distribution curve in Image 2 shows an example of d50. Not all slurries will result in a symmetrical distribution. Image 3 illustrates a median d50 that is not equal to the mode of the curve. At a high level, slurries can be classified into two categories: settling (heterogeneous) or nonsettling (homogeneous). The slurry category will be the basis for determining which calculation method to implement: viscosity corrections (nonsettling) or concentration corrections (settling). So how is a slurry determined to be settling or nonsettling? Per the HI method, the particle size (d50) and solids specific gravity (SS) is used to determine the slurry flow regime. 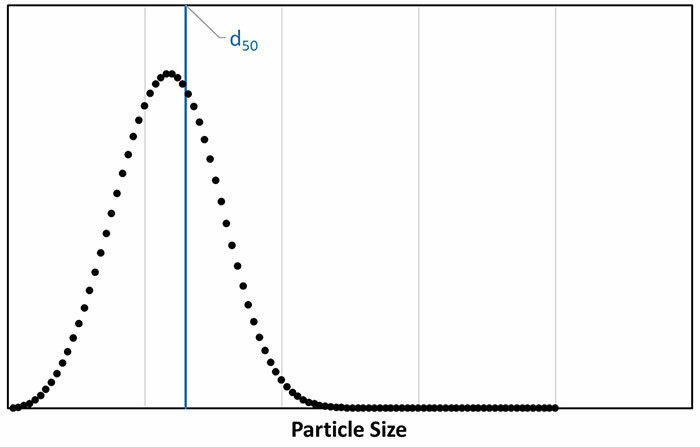 The Wilson method differentiates the two regions solely on particle size. Nonsettling slurries are considered to have a particle size, or d50, of 50 microns or smaller. Slurries with a d50 larger than 50 microns are categorized as settling. Starting with the same slurry properties, a water-based performance curve will be de-rated per both the HI and Wilson methods. For a centrifugal pump operating at constant speed in this slurry application, it is expected that there will be an increase in power requirements over the water-based curve. It is also expected that the head and efficiency supplied by the pump should decrease, as shown in Image 4. Each method was used to determine the Hr correction factor. This factor was then used to correct each head and efficiency point. The HI method calculated an Hr correction factor of 0.533, while the Wilson method calculated the factor to be 0.835. For this chosen slurry, the HI method resulted in more conservative corrected performance curves. Depending on the application and slurry, an engineer may either select one of the methods or use the methods’ Hr values to define a correction region and choose an Hr value between the bounds. Wilson method. Efficiency curves are in green. Often, pump manufacturers will develop their own slurry correction methods specific to their respective pumps. In all cases, the pump supplier should be consulted directly, especially when the application’s fluid is not water at the manufacturer’s test conditions. Metso. (2014). Slurry Pump Basic (Edition 6 - EN). Sala, Sweden: Metso Minerals. Wilson, G. (1987). 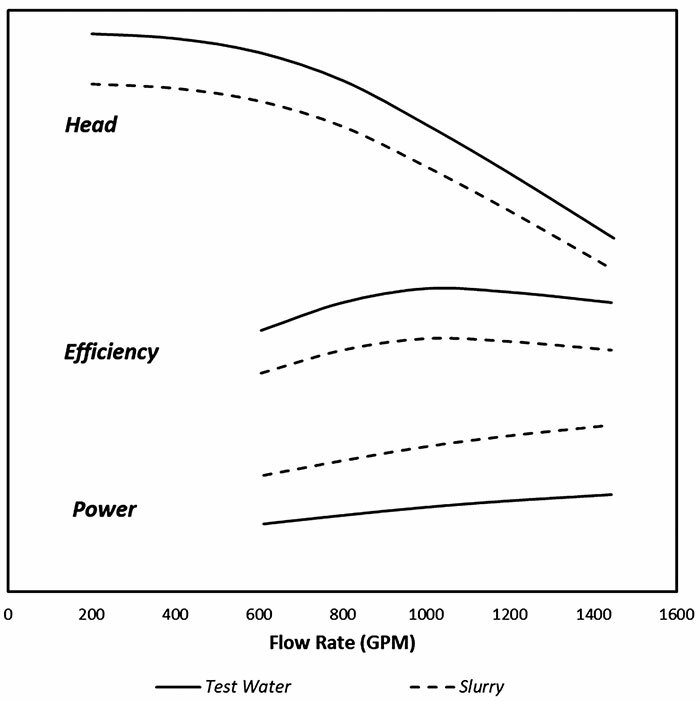 The Effects of Slurries on Centrifugal Pump Performance. In Proceedings of the Fourth International Pump Symposium (pp. 19-25). Baldwinsville, NY: Texas A&M University.